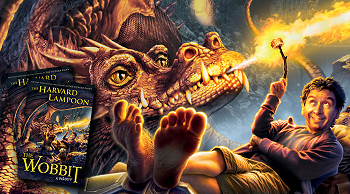 Fantasy literature that is parodic, lighthearted, wacky, snarky, or just plain buffoonish. Notable practitioners include Douglas Adams, Jasper Fforde, Esther Friesner, Tom Holt, Walter Moers, Christopher Moore, John Moore, and Terry Pratchett. Subpage of Comic Literature. Also see Fantastic Comedy.